Knightridge Observatory, Bloomington, Indiana. Photo credit: JR. 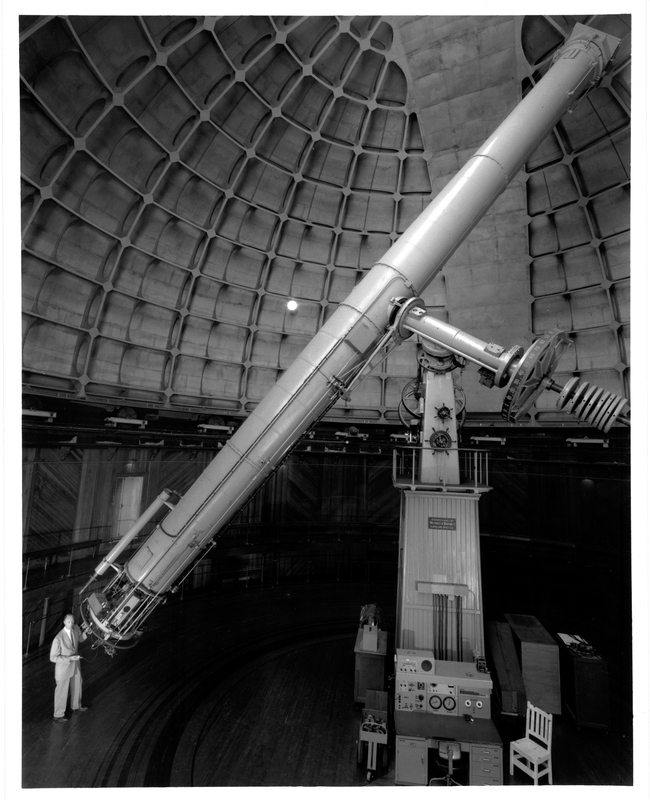 In my earlier post about (then upcoming) events at the New Jersey Astronomical Association, I mentioned that the telescope at the Paul H. Robinson Observatory used a frame and mount acquired from Indiana University in the mid-1960s. The images of the frame in its previous home on the NJAA website inspired me to make the ten-minute trip over to Knightridge to inspect the abandoned IU observatory. As you can see from the photo above, the rather squat building is now surrounded by a small, young wood in suburban Bloomington. 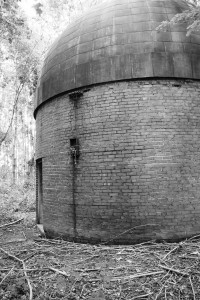 At the time of its construction in 1936-37, however, this was a relatively remote site. In fact, it’s far enough outside the (then) city limits that I was surprised to see the obvious signs of electrical connections on the outside of the building (below). My neighborhood, which is closer to town, didn’t get electricity until 1960, so I guess I’m envious that IU managed to run a line out into the fields of Knightridge. 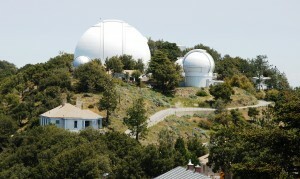 Approach from West, Knightridge Observatory. Photo credit: JR. The building is in remarkably good condition. The mortar between the bricks is holding up well, and although the roof is highly oxidized, it’s still keeping the rain water outside where it belongs—for the most part, that is. The southeast roof of the building, including one of the shutter doors in the dome, was hit by a falling tree, unfortunately. 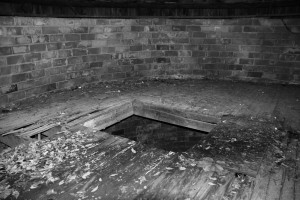 If this hadn’t happened, the interior would still be dry and tight. Now, as you can see, not only are daylight and water making their way inside, so are plant seeds. 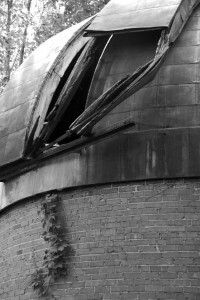 Storm Damage, Knightridge Observatory. Photo credit: JR.
From the outside, the dome looks truly round, but the construction details inside tell a different story. 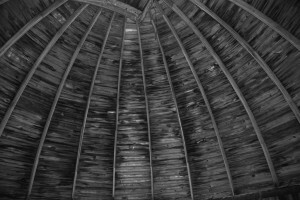 Underneath the sheet metal is a dome constructed of jointed wood ribs in-filled with flat lumber that diminished in length as it approached the apex of the dome. It’s not quite a corbeled beehive vault, but it gives a good approximation of the effect, rendered in wood. 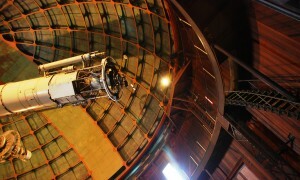 Dome Interior, Knightridge Observatory. Photo credit: JR. 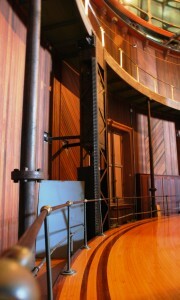 The dome was raised on steel tracks that rested on wheels attached directly to the brick walls of the observatory. 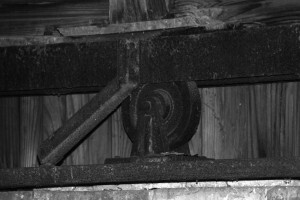 Wheel, Knightridge Observatory. Photo credit: JR.
All of the wires and most of the mechanics that supported the rotating dome have been stripped from the observatory, leaving behind interesting but non-functional bits and pieces on the second story of the building. 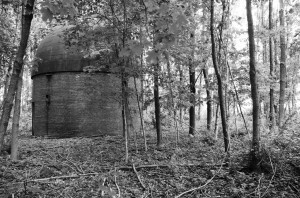 Abandoned Knightridge Observatory. Photo credit: JR.
Because the dome is no longer water tight, this upper floor is starting to rot. The rectangular opening that once held the mount for the telescope frame is dangerous territory, and I can only hope the people who’ve been using the observatory for late night séances are being very, very careful. 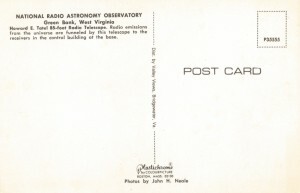 Second Floor, Knightridge Observatory. Photo credit: JR. Despite the weather damage, it’s clear that this is one sturdy little building. It’s also clear that Professor Cogshall wasn’t all that concerned about aesthetics. 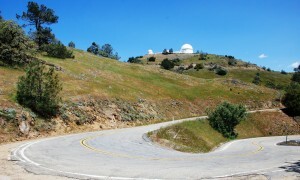 Reconsider the Lick Observatory: a dome painted to resemble the heavens, walls finished in California redwood, floor finished with a high-polish mahogany. This modest university observatory bears no trace of a finish plaster or floor varnish. Cogshall was here to get the job done, apparently, and saw no need for embellishments that probably wouldn’t look like much under a red light at night, anyway. You can view a few more photos of the abandoned building on my flickr site. 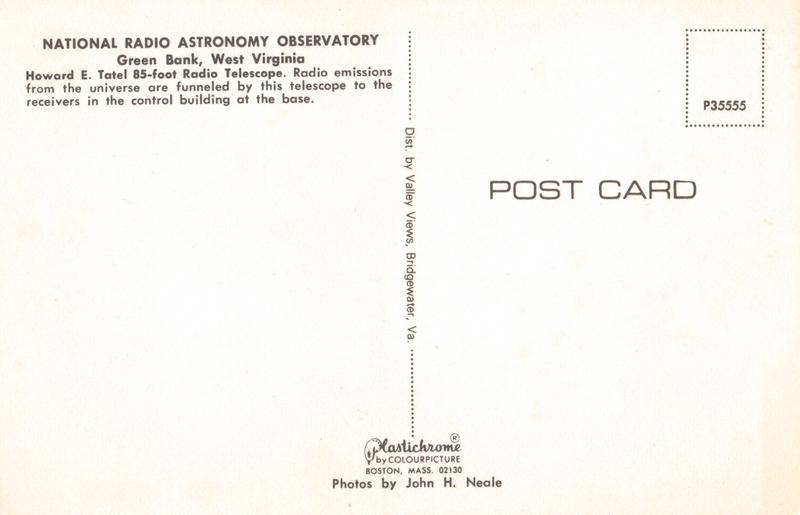 Wednesday’s mail brought me this “vintage” postcard of the Howard E. Tatel Radio Telescope. 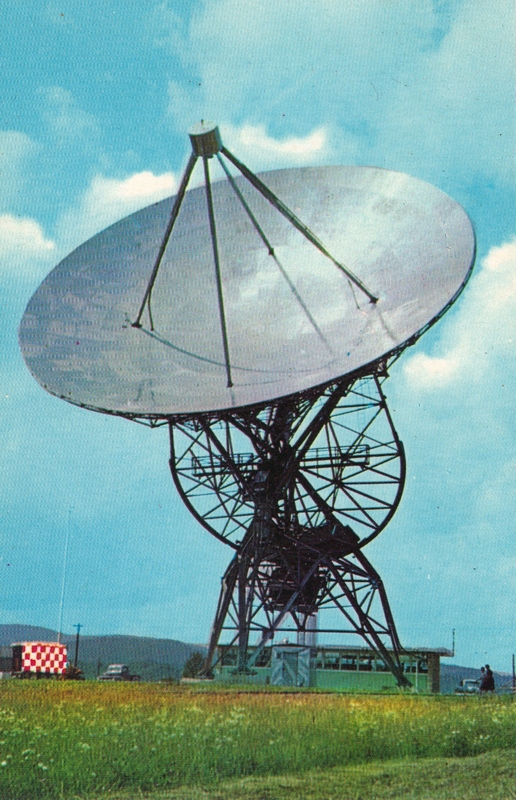 Built in 1958, the Tatel was the first major radio telescope at the National Radio Astronomy Observatory (NRAO) in Green Bank, West Virginia. 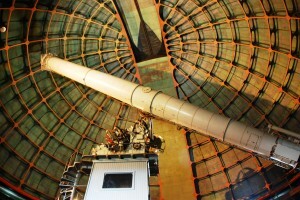 Also known as “85-1,” the scope has served as a fixed element in the Green Bank Interferometer (GBI) since 1964. Alpha Magnetic Spectrometer-2. Photo credit: NASA. Today’s wallpaper shows the Alpha Magnetic Spectrometer-2 (AMS-02) holding steady in its new home on the integrated truss structure of the International Space Station. 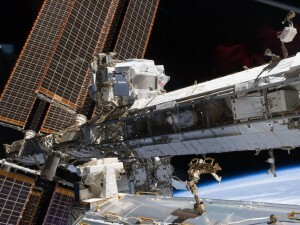 Delivered to the ISS on May 19th by STS-134 under the command of Mark Kelly, the AMS-02 will be the first magnetic spectrometer used in space. From its orbital position, the instrument will gather and measure cosmic rays as part of the on-going search for primordial antimatter and dark matter in the universe. At the heart of the AMS-02 is a large magnet, the field of which will be used to distinguish matter from anti-matter. As particles and anti-particles pass through a uniform magnetic field, they bend in opposite directions. The specific particle curvature (positive or negative) identifies the particle as electron or positron. In addition, the radius of the curvature allows scientists to measure the particles momentum at the time of collection. More on the science (dark matter, anti-matter, strangelets, and cosmic rays) and technology (instruments) of the AMS-02 can be found on the instrument’s website. You can also follow the instrument on twitter @AMS-02. Atacama Large Millimeter/submillimeter Array (ALMA) antennae. 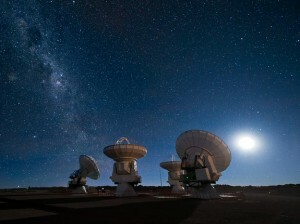 Photo credit: ESO/José Francisco Salgado. Today’s wallpaper comes to us courtesy of the European Southern Observatory (ESO) in Chile. What you see are four antennae completed as part of the Atacama Large Millimeter/submillimeter Array (ALMA). ESO and its international partners are in the process of constructing sixty-six of these antennae, all tuned to observe cold-body radiation with wavelengths of a millimeter or less. Radiation with such short wavelengths comes mostly from cold gas and dust clouds, in which stars are being born, or from early, cooling galaxies. Astronomers hope that the information gathered from these cold objects will bring us one step closer to understanding the origins of the universe. ESO has provided a four-minute “trailer” about the project, available in multiple formats (HD always recommended if your system can handle it) in the video archive. Look for the brief glimpses of the construction equipment. My doctoral research focused on instruments derived from Ptolemaic principles. However, one of the observatories on which I based my project was also associated with an astrolabe foundry during the first half of the 18th century. 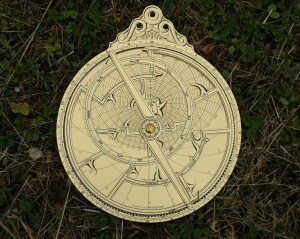 Technically, astrolabes aren’t Ptolemaic. The stereographic projection on which the astrolabe depends was first described by Hipparchus c. 150 BCE, some 250 years before Ptolemy described it in his Planisphaerium (2nd c. CE). All the same, I could see needing to explain functionality of the instrument to my dissertation committee, so I started keeping track of the better resources on the instrument in my research notes. A few fragmented astrolabes exist at one of my research sites, mostly in the form of tympani missing the necessary moving parts (the rete, rule and alidade) to make them useful. Staring at the tympani didn’t do me much good and my reading made sense in theory, but lacked practical examples. 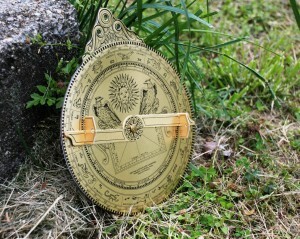 I really didn’t want to find myself standing in front of my examination committee, stammering for an answer when they asked me to explain how to use an astrolabe to determine local solar time. Enter Adler Planetarium, the sole purveyor of Roderick S. Webster’s Astrolabe Kit, the solution to my problem. * I’m a great believer in hands-on learning experiences. If you want to know how something works, try building it for yourself. Or try putting it back together after you’ve taken it apart. 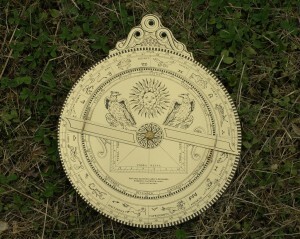 It works with construction methods used in residential design and, as it turns out, it also works with astrolabes. Webster’s kit is a little pricey (around $20) but I think I’ve gotten twenty bucks worth of entertainment and education out of it. It took me about three days to build the thing because of its complicated glue demands. Without glue, it would’ve required 30 minutes, tops, including sanding the rough edges and assembly. Learning how to use the thing is been a different matter. I’ve spent (literally) hours sitting at my desk working through the various problems it’s supposed to help me solve. Local skies have been persistently overcast, so I’ve been using Stellarium to help me determine the altitudes of various stars (if the skies ever clear up, I’ll be able to sight them through the rule on the back of the astrolabe. IF THE SKIES EVER CLEAR UP.). I’m currently using the tympanum set up for a latitude of 42 degrees. That gives me the skies about Barcelona (41 23 N), Marseilles (43 20 N), Rome (41 54 N), Sofia (42 40 N), and Vladivostok (43 10 N) with which to play this evening. And playing is what I’ve been doing. Sidereal time, solar time, time from the sun, sunrise and sunset, the positions of the moon and planets, rising and setting of a few major stars… Some calculations are working better than others, but I’m not quite sure why. Once I’ve determined the latitude of a star and set the rete, I never move it, no matter what problem I’m trying to solve. It’s a bit of a mystery as to why one answer is immediately obvious and the next isn’t, but it’s also a bit of fun. *N.B. I spent an outrageous amount of time trying to find the kit in the newest version of Adler’s online store, yet still failed to locate it. You might have to call them if you really want one. Construction of Mark I Telescope. Photo credit: Jodrell Bank Centre for Astrophysics, University of Manchester. 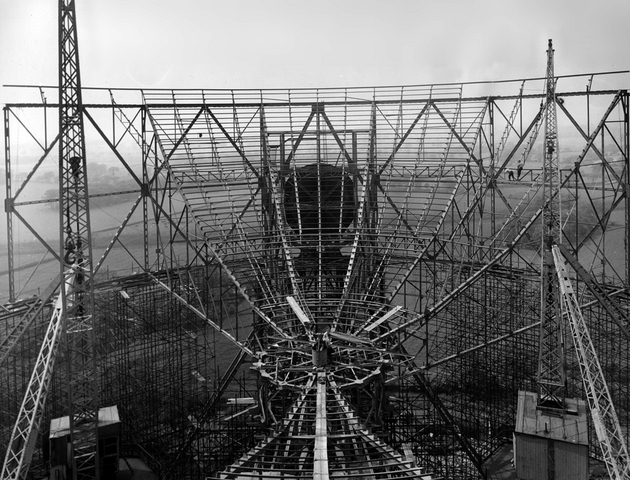 Today’s wallpaper is a photo taken during the construction of the 76-meter Mark I (Lovell) Telescope at Jodrell Bank. Designed by Bernard Lovell and completed in 1957, the Mark I was designed for mobility. 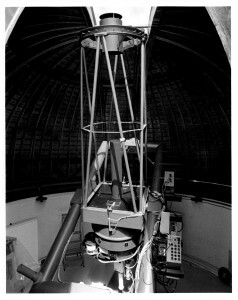 Lovell had been using a transit telescope, a 66-meter stationary dish pointed at the overhead sky, in his search for cosmic rays. 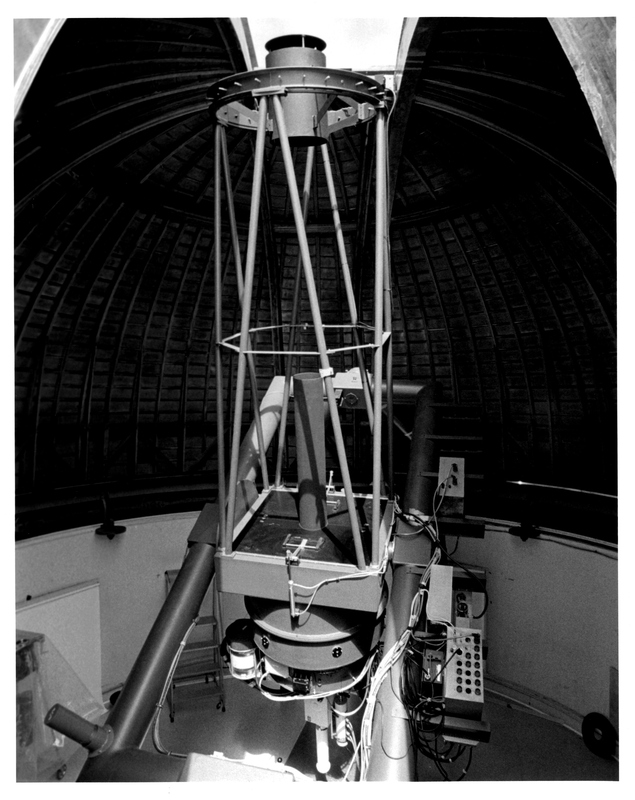 While the transit instrument was a suitable beginning, Lovell realized fairly quickly that his work was limited by an inability to re-direct the telescope’s attention to other parts of the sky. The early construction photos are pretty stunning—the photographer(s) did a good job of capturing the complexity of the steelwork needed to support the dish, not to mention the intricacy of the scaffolding used by the construction workers. 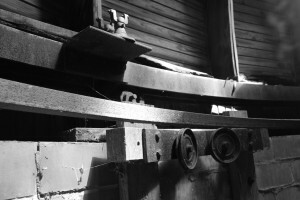 Several alterations have been made to the instrument since its completion: the railroad tracks on which it rotates have been replaced; the support structure has been shored up numerous times; it was given a new reflector in 1970-71 that significantly increased its functionality. The dish was resurfaced as recently as 2000-2003. If you’re interested in viewing the Mark I(a)/Lovell telescope in person, check out the Jodrell Bank Discovery Centre online (there is no public access to the research labs at Jodrell Bank Observatory, but you can take a web tour). If you’re curious as to what the Lovell is observing right this moment, you can see a live update on the Jodrell Bank Telescope Status page. 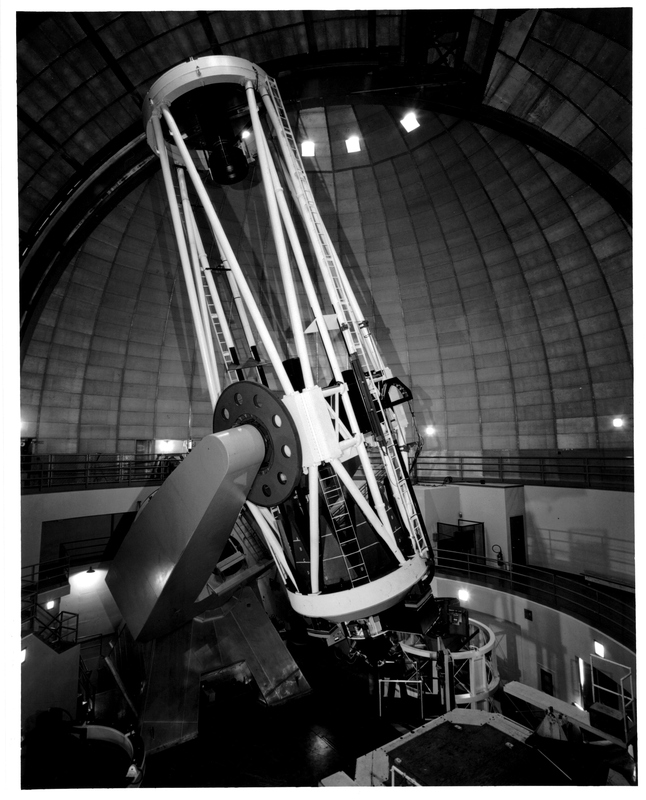 You can even follow the telescope on twitter (@LovellTelescope). One last note: if you want to see a truly impressive grant application, read The Blue Book, Lovell’s research and funding proposal submitted to the Department of Scientific and Industrial Research in 1951. Would that everyone could write such a clear explanation of his or her work and its broader impact. Good news in the paper this morning: India gets to join the SKA project, after all!